Download on Amazon, Amazon EU, B and N, iTunes. 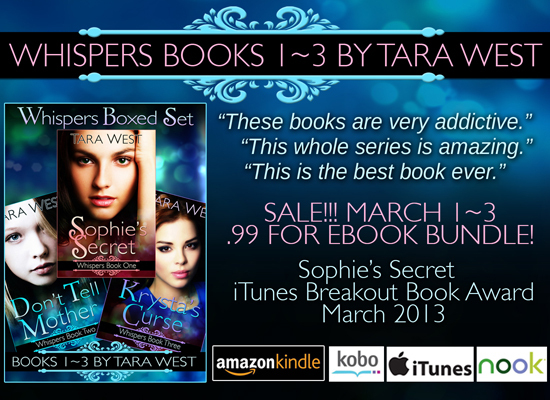 Buy the Boxed set and save money! 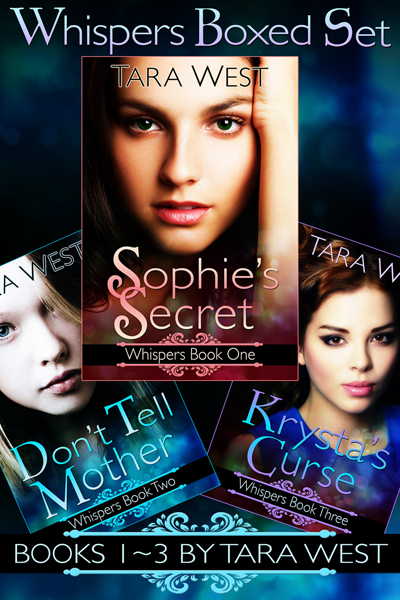 The Whispers Boxed Set includes the first three books in the Whispers Series, Sophie’s Secret, Don’t Tell Mother, and Krysta’s Curse. Books four, five and six: Visions of the Witch, Sophie’s Secret Crush, and Witch Blood are not included in this collection. 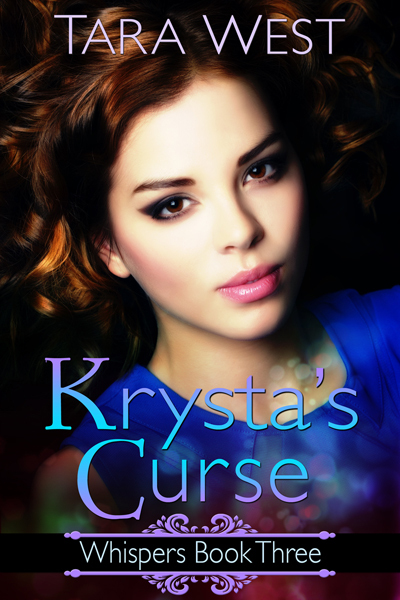 Categories: books, news | Tags: boyfriend, cheap kindle books, cheap reads, crush, don't tell mother, krysta's curse, magic, paranormal, romance, sophie's secret, tara west, whispers, witch, ya | Permalink. 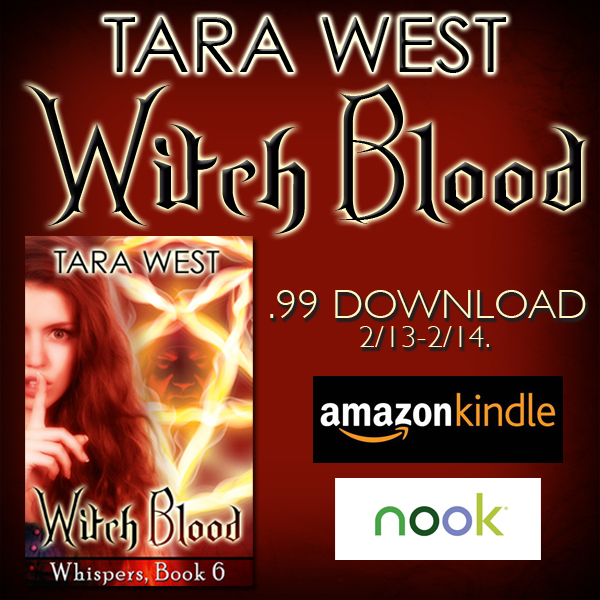 Witch Blood is out and on sale! 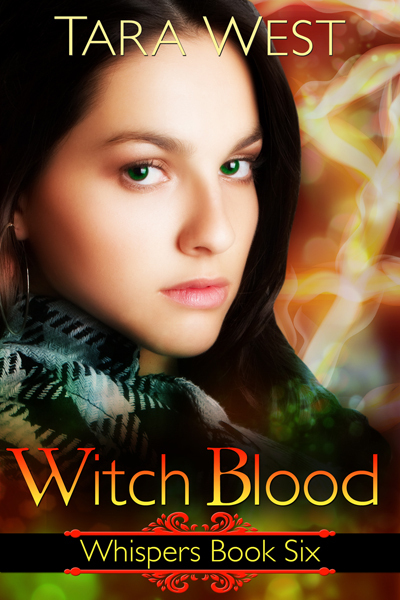 Witch Blood by Tara West: If Sophie Sinora survives tonight, she’s sure to be grounded for life. But that’s the least of her problems. She’s thousands of miles from home, people are not who they seem, and she doesn’t know friend from foe. 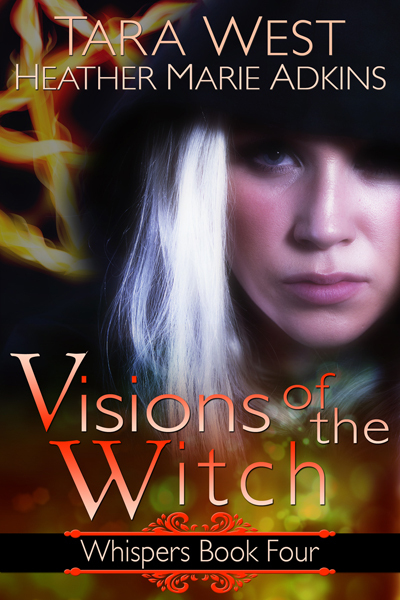 She needs to keep her hot witch boyfriend, with an even hotter temper, from losing his cool before the incubus finds them and steals their souls. And she’d thought she was having a bad week when she sprouted that ginormous pimple on her nose. If only her life was that simple. Categories: books, news | Tags: 99 Amazon books, Amazon, bargain Nook book, book boyfriend, boyfriend, cheap kindle books, crush, horror, Nook bargain, romance, sophie's secret, tara west, teen, witch, Witch Blood, ya, young adult | Permalink. Witch Blood is almost here! So I know Witch Blood’s release date was scheduled for the end of February, but it’s going to be out a little early, as in tomorrow! 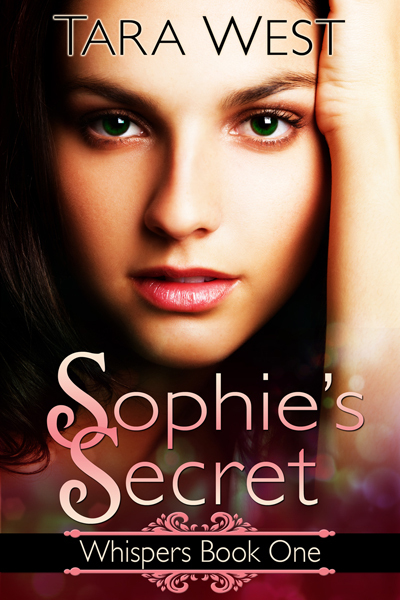 Please remember to load your Kindles and iPads with Sophie, AJ, and Krysta’s latest story. I hope you enjoy it! “Ethan, I’m sorry.” I reached toward him, but he jerked away. “Not as sorry as Sleznick’s going to be,” he growled. “Efan, you’re too hot. Get away,” his sister whined. When Ethan scooted toward me, I gasped. The heat radiating off his body buzzed with this strange ominous hum. Oh, this was so not good. In all my life, I’d never been as scared as I was now. We were being hunted by a demon with powers beyond our knowledge, and my boyfriend was set on killing him. I got this sick roiling feeling in my gut that Ethan would be the one killed instead, and me and Kaylee along with him. Ethan just stared straight ahead, his face a mask of stone and his eyes unblinking. Panic alarms were ringing in my ears. What was Ethan planning? He couldn’t risk exposing us to Sleznick. The incubus would kill us all. I wasn’t ready to die. I was barely a kid. Images of my family flashed through my mind. My mom and dad would be heartbroken. My nephews would grow up without their aunt. I couldn’t let that happen. I couldn’t let Ethan risk our lives just to get revenge. Steeling my resolve, I turned to him and squared my shoulders. My stomach lurched into my throat when the boat tilted forward. I turned just as the other passengers collectively gasped. Holy heck! A giant swell of water rose up behind us from out of nowhere. I didn’t remember this happening on the Dreamy World ride. This wasn’t supposed to be a roller coaster. This was a gentle ride for little kids and terrified teenagers. The crest of water pushed us forward at an alarming pace as the boat violently banged against the railing while whizzing by the Dreamy singers of all nationalities getting tucked into bed. Kaylee giggled and held up her hands as water droplets from the cresting wave splashed our heads. The other passengers laughed nervously while casting anxious glances at each other. They probably hadn’t expected to be catapulted by a roaring tidal wave on this ride, either. Ethan’s face was now crimson. I did a double take, thinking maybe the flashing Dreamy World lights were casting a strange shadow over my boyfriend, but no, his face was truly crimson… and glowing! Categories: books, news | Tags: boyfriend, fantasy, paranormal, romance, sophie's secret, tara west, teen, whispers, Witch Blood, ya | Permalink. 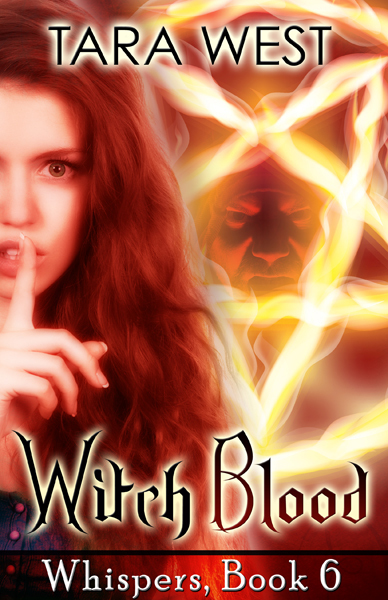 Witch Blood (Whispers book six) is over on GoodReads now. Please add it to your TBR pile. Initial beta responses are in, and so far they love it. I sure hope you do, too. The book is scheduled to be released the end of February, but I predict it will be released a week or two early. I can’t wait to share it with you! “Ethan, I’m so sorry,” I said as soon as we pulled out of my driveway. He shrugged a shoulder and laughed, doing his best to look casual, but I wasn’t fooled. The way he clutched the steering wheel reminded me of that time I held onto the safety bar at Dreamy World’s haunted castle ride. Again, in my defense, I thought those ghosts were real. “You mean embarrassing the hell out of me?” I groaned. He laughed again, but the nervous energy behind it skirted across my psyche, and I felt Ethan’s panic jumping off his skin in erratic currents. I didn’t want to pry into his mind, even though, as a telepath, that’s what I did best. But seriously, what was up with Ethan? I should have been the one on edge. Ethan’s heady cologne wrapped around my senses in a warm embrace, setting my hormones on high alert. And his full lips were begging to be kissed. I could practically hear them calling to me. I was sorely tempted to ask Ethan to pull over so we could make out. Besides, I so wanted the distraction after my crazy week. Maybe a make out session was what he needed to take the edge off, too. “So we’re really going to your parents’ party, right?” I asked. I blinked once, then twice, waiting for my boyfriend to break into a fit of laughter and tell me that it was all just a joke. But his features hardened like granite, and the temperature in the car dropped like twenty degrees. I swear the temperature dropped another ten degrees. Even though my limbs felt frozen, I leaned over and set Ethan’s heater to full blast. We’d come to a stoplight, and Ethan was staring at it like he was transfixed. Finally, he turned toward me, and I watched a knot jump in his throat as he swallowed. “You don’t need to do anything. We just need your uhhh…” He turned away, his cheeks flushing as bright as the glaring red light in front of us. I’m pretty sure I stopped breathing at this point, and I gaped at my boyfriend like he’d grown a second head. He looked away from me and put the car in drive. I turned my head and stared out the window as cars whizzed by. At first, my brain was too numb to process what Ethan had just told me, but then his words started to filter into my brain, like coffee on a slow drip. Ethan had pulled into the driveway of a two story house. Several cars were parked along the sidewalk, and all of the lights were on inside. Voices carried from behind the large bay window where I saw shadows moving frantically about. O-mi-freaking-God! We were at his house! “Are you serious?” I practically screeched. The car suddenly warmed to the point that Ethan had to roll down the windows and let in the cool air. He turned to me with his palms out in a defensive gesture. Ethan’s face colored before he looked away. “That’s okay.” I waved him away with a flick of the wrist. “I don’t need to know.” Truthfully, the thought of Ethan doing that stuff with another girl gnawed at my insides like a starving dog with a bone, but I wasn’t about to tell him that. He was older than me, plus he had a car, and he was cute. Really cute. I was sure he’d had more than one girl, and I was sure it wasn’t that long ago. “She’s freaking four years old!” I wagged a finger, sorely tempted to ball up my fist and punch him again. 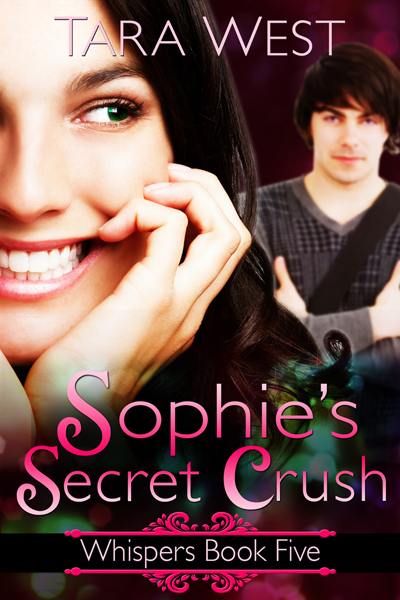 “We need a virgin, Sophie,” Ethan pleaded, his bright blue eyes darkening and his lip turning down in a too cute pout. “Fine. I’ll do it.” I folded my arms across my chest and flashed a pout of my own. When Ethan leaned forward and brushed a feather soft kiss across my forehead, I felt my resistance weaken even more. This had to be the worst first date in the history of history, and I was the craziest, stupidest girlfriend on the planet. I knew we needed to get rid of Sleznick. I shouldn’t have been a baby about a little drop of blood, but I didn’t need AJ’s gift of foresight to know that this ritual had the potential to go terribly wrong. 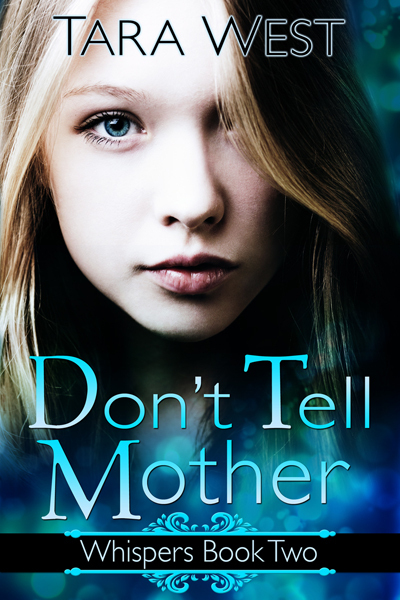 Categories: books, news | Tags: boyfriend, demon, horror, paranormal, romance, sophie's secret, tara west, teen, witch, Witch Blood, ya | Permalink.